Removal ProcedurePlace the transmission in neutral-(N).Raise and support the vehicle. 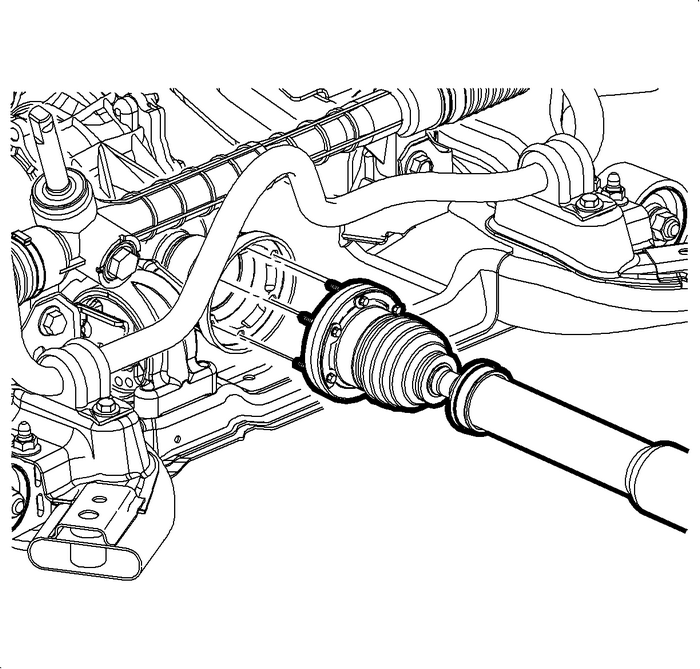 Refer toLifting and Jacking the Vehicle.Mark the relationship of the propeller shaft to the reardifferential drive flange and the transfer case.Support the propeller shaft at the rear differential. 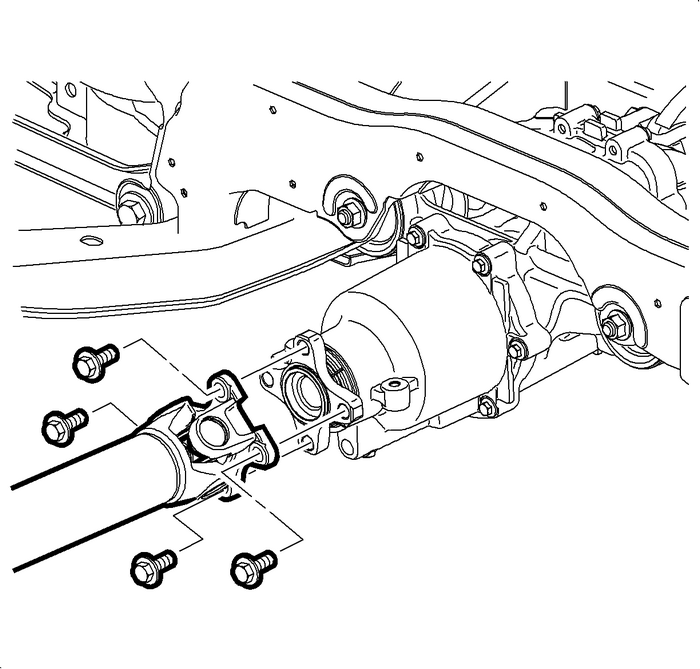 Remove the mounting bolts for the propeller shaft at the reardifferential drive flange.Support propeller shaft at the transfer case. Remove the mounting bolts for the propeller shaft at thetransfer case.Support the propeller shaft at the center supportbearing. Remove the mounting bolts for the center supportbearing.With the aide of an assistant, remove the propeller shaftfrom the vehicle.Installation ProcedureThoroughly clean the mounting bolts for center bearing andthe front and rear propeller shaft flanges. Apply threadlocker,GM-P/N-89021297(Canadian-P/N-10953488), to the boltthreads.With the aide of an assistant, position the propeller shafton the supports.Align the reference marks on the front and rear of thepropeller shaft to the transfer case and rear differential. Position the propeller shaft on the transfer case outputflange.Finger tighten the mounting bolts for the propeller shaft atthe transfer case output flange. Position the center support bearing of the propeller shaft onthe vehicle.Finger tighten the mounting bolts for the center supportbearing. 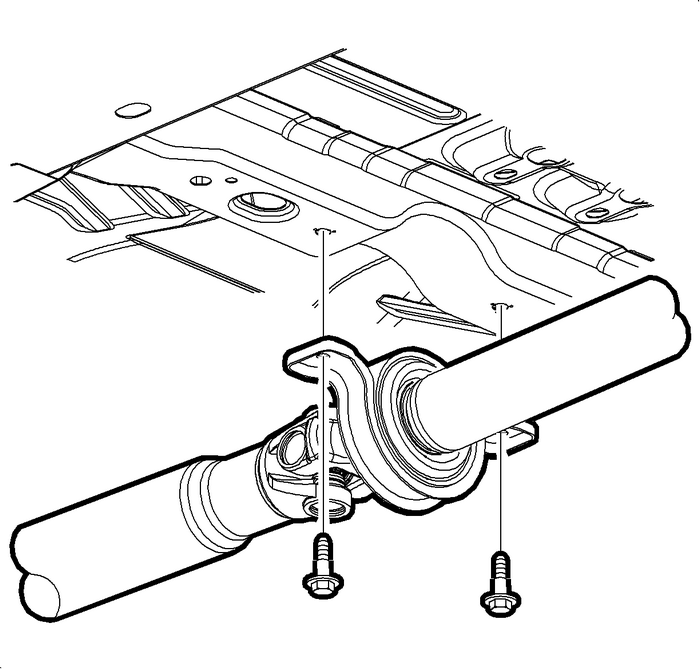 Position the propeller shaft on the rear differential driveflange.Finger tighten the rear mounting bolts for the propellershaft. Tighten the front mounting bolts for the propellershaft. Tighten the mounting bolts to 35-Y(25-lb-ft).Tighten the mounting bolts for the center supportbearing. Tighten the mounting bolts to 25-Y(19-lb-ft).Tighten the rear mounting bolts for the propeller shaft yoketo rear drive axle. Tighten the mounting bolts to 50-Y(37-lb-ft).Remove the supports for the propeller shaft.Lower the vehicle.